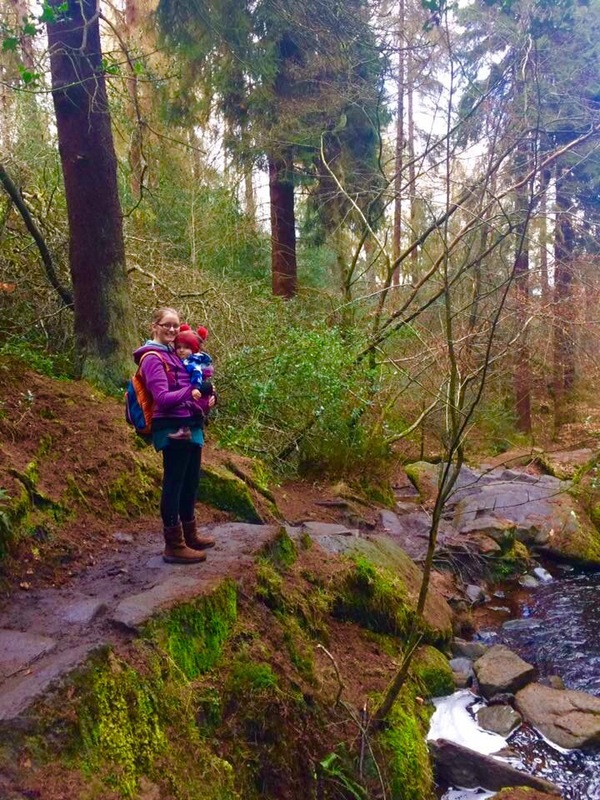 6 places for Peak District family walks near Sheffield | Peak District, local parks and more - free days out with lots of fresh air and nature play! Are you wondering where to go for a lovely walk out in the countryside? These ideas are my favourites. 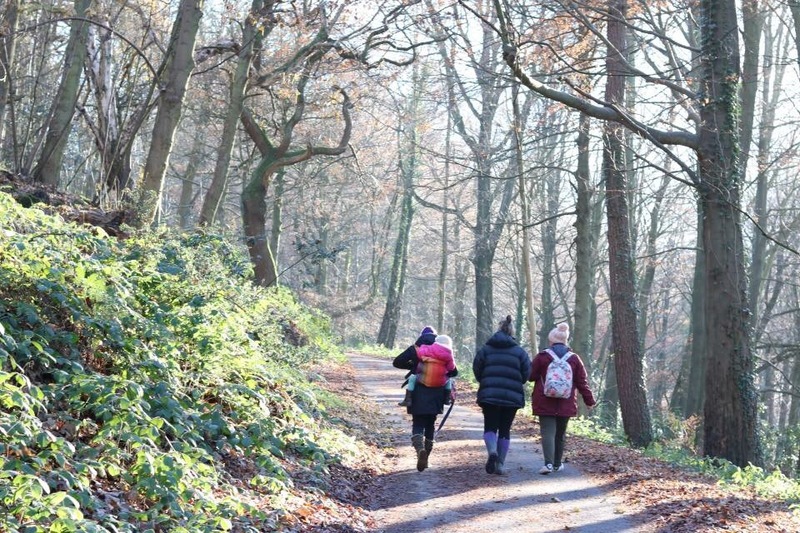 They’re beautiful places for Peak District family walks near Sheffield and in this post you’ll find tips of how to get there by public transport, best routes for walking, parking info, and more! Get outside and enjoy. These walks can be enjoyed all year round, wrap up warm in the colder months and take a flask of coffee, or in the warmer months find an amazing picnic spot on one of these walks. Walking can boost your mind, body and soul (Graham Barker, psychologies.co.uk). Walking is a way you can appreciate the nature around you and explore your surroundings. Fresh air is healthy and getting outdoors is a great activity for you and your family. You can spend quality time with your loved ones, bond with your children and get some exercise…. all while enjoying the surroundings. Plus, walking allows children to explore their natural environment, and this inspires their imagination. 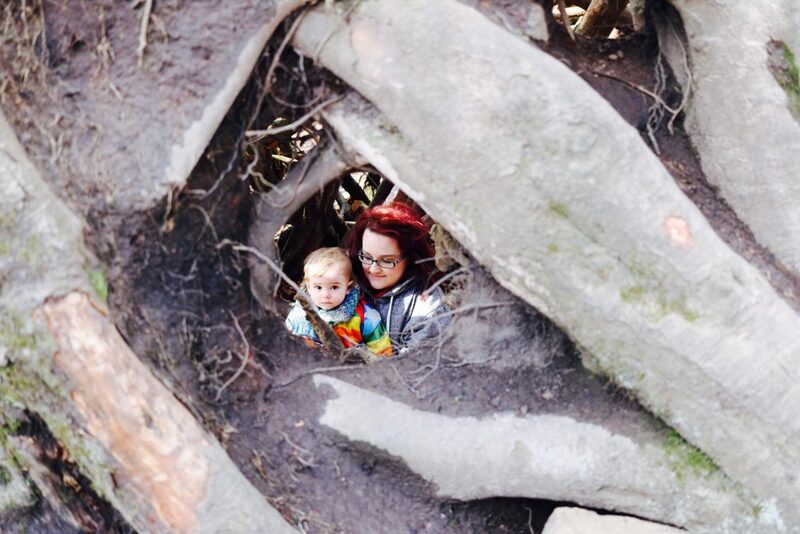 These walks are suitable for babies through to teenagers, enjoyable for the whole family. Most are pushchair friendly and all suitable public transport. Read this guide to using public transport by bus from Sheffield. 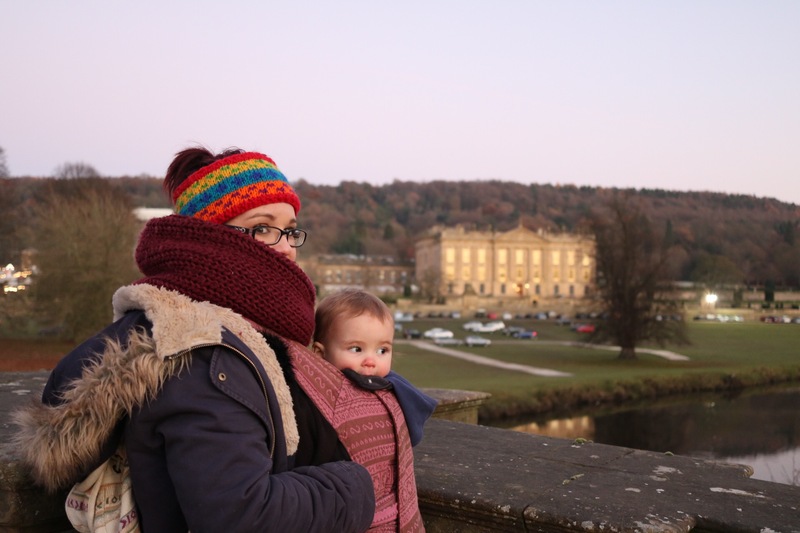 Chatsworth House offers lots of walking opportunities and space to enjoy a stroll in the countryside. You can buy a ticket for the gardens or take full of advantage of the free estate walks. Many people think they have to pay to enjoy chatsworth but this is not true, there are miles and miles of estate walks which you can explore completely free. See trails here. Stand wood is beautiful and a must to explore and I really recommend going up to the hunting lodge for getting a really good view over Chatsworth. 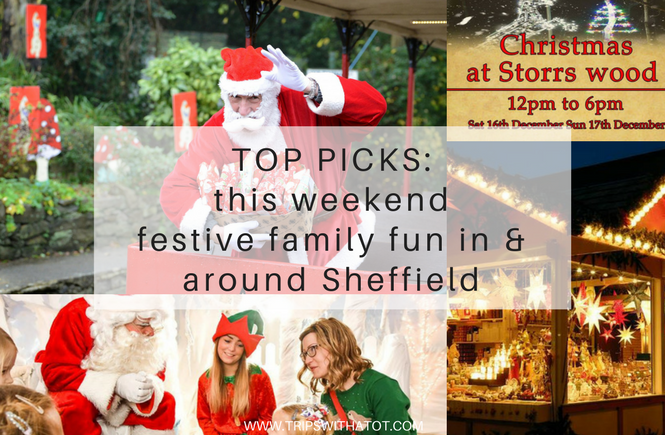 With children, definitely don’t miss a visit to the farmyard and playgrounds. My favourite walk is this one and it is completely pushchair friendly, with accessible paths the whole way, suitable for new walkers. There’s much to see on the way, bridges, hunting tower with amazing views (you can stop here for a picnic), lakes and muddy corners. 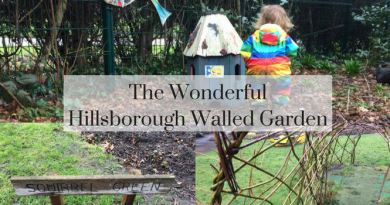 Lots to areas with nature play and an exciting walk for adults. To find photos and details of this trail, find our most recent walk here at Christmas in 2017. Public transport and parking: bus 218 Sheffield to Bakewell stops in Chatsworth car park, there is a car park with charge. 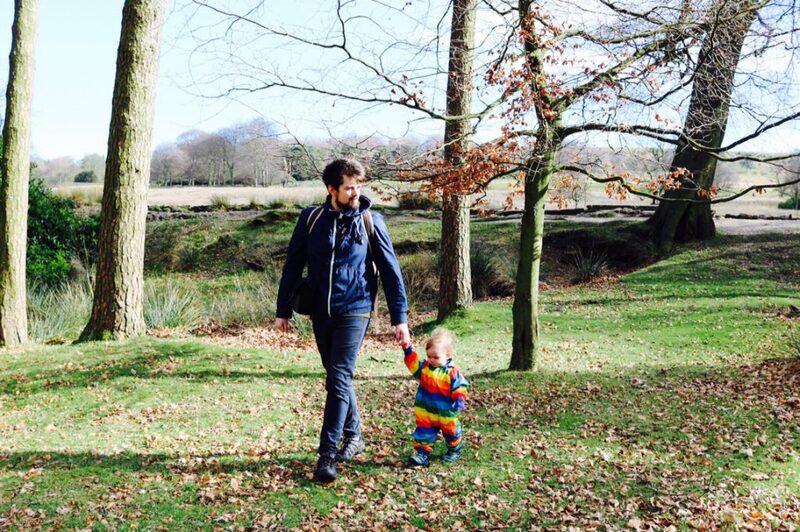 Longshaw Estate is one of the best places for a day outdoors with kids. Now my son is walking, it’s perfect for him to toddle around as there are flat paths and nature play opportunities. It has a lot to offer and with being a National Trust site you can be reassured with good facilities such as toilets and cafe. Walking trails are sign posted and suitable for pushchairs and wheelchairs. There’s gorgeous views, nature trails and a duck pond! For a perfect day, walk through Longshaw Estate and head down into Padley Gorge (roughly 1/2 mile, you can see the trail here with a video). This the best spot for a picnic in summer. Kids can sit by the stream and play in the rocks, paddle and the views are spectacular. 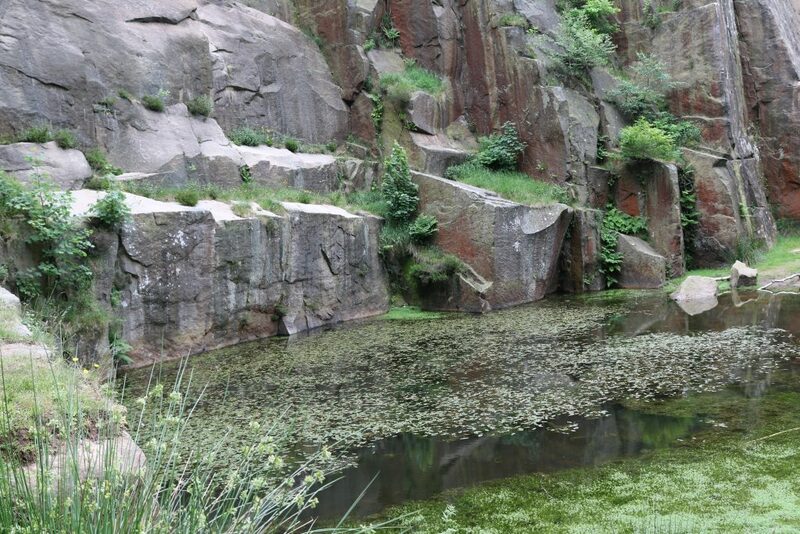 The surroundings at Padley Gorge make it feel like a hidden gem! It feels secluded and quiet. 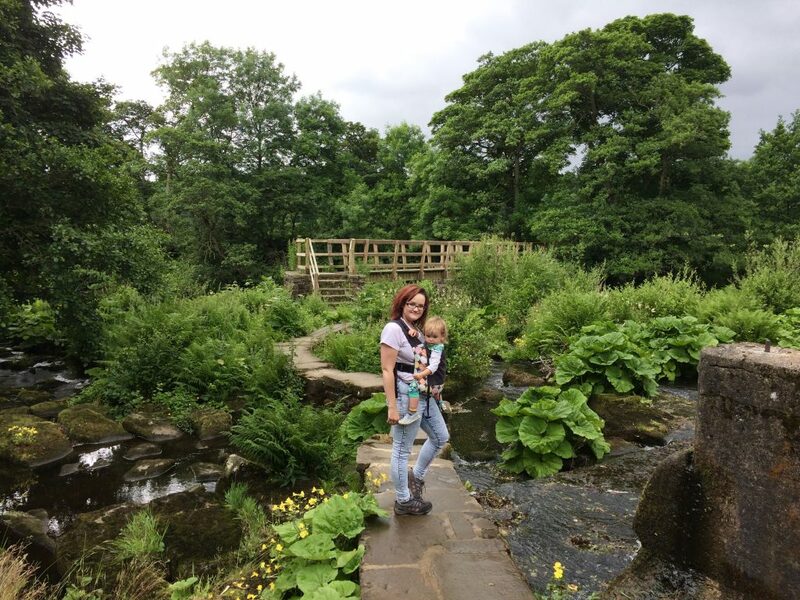 Pushchair friendly: Yes for Longshaw, Padley Gorge has a steep rocky incline down to the stream; many people manage just carrying the pushchair down. Or use a baby carrier. Waking footwear: Not needed for the gentle walks but recommend wellies for Padley Gorge. Parking and public transport: Bus 271 from Sheffield to Castleton and 65 Sheffield to Buxton stop are Fox house just across the road from Longshaw. See my public transport guide here. Parking costs or free for NT members and in pub car parks. Lodge moor in Fulwood, west Sheffield is home to Redmires reservoir and Wyming brook. One of my favourite walks to do starts from the car park of Three merry lads pub. Head left over cliffs with views to redmires reservoir, down into wyming brook stream and climb back up to lodge moor scrambling through rocks and boulders. This is a walk I often do. The walks around here have no clear path, climbing over rocks and difficult to do. This would be tricky for little feet and not suitable for pushchairs. If doing this walk please wear good footwear and use a baby carrier. This walk has it all: woods, streams, high up views, stepping stones, boulders, rock climbing, open land and exquisite views. Free parking at three merry lads lads pub, easy to get to by Sheffield bus 51 and a halfway break point with benches for picnic. Tip: go in spring and autumn to get the most of out the colours. Public transport and parking: Sheffield bus 51 terminates in Lodge moor, there are free car parks for pubs. Surprise view in Hope Valley is a fantastic starting point for walks and has spectacular, dramatic landscapes. A car park and bus stop means you can get there easily and explore. There’s many options. Simply look around and enjoy the view point at surprise view. Or head up to mother cap, scramble on boulders and stop for a picnic whilst admiring beautiful surroundings. There’s the option of walking down into bolehill quarry for a mysterious walk in fairytale surroundings which I recommend! Surprise view is somewhere everyone should have the opportunity of seeing and it’s very acessible! You can make a day out of it by walking, or just enjoying a picnic. Nearby is the historic village of Hathersage with pubs, cafes and shops. Pushchair friendly: There is a wheelchair accessible path from the car park to the viewpoint, but the surrounding walks are not suitable for these. Two great options for walks around these area. You can learn all about the sunken village and visit the dambusters museum, too. These walks are set in pretty surroundings with reservoir views and woodlands. There’s cycle hire at Fairholmes, toilets and parking at Heatherdene and options for a flat, pushchair friendly walk around Ladybower. I highly recommend a walk to/from Bamford Mill – Ladybower Reservoir. Here’s details of the trail and a video here. Bamford Mill is a hidden gem and is a beautiful, quiet haven. You can picnic here whilst sitting with the ducks and admire the nature. 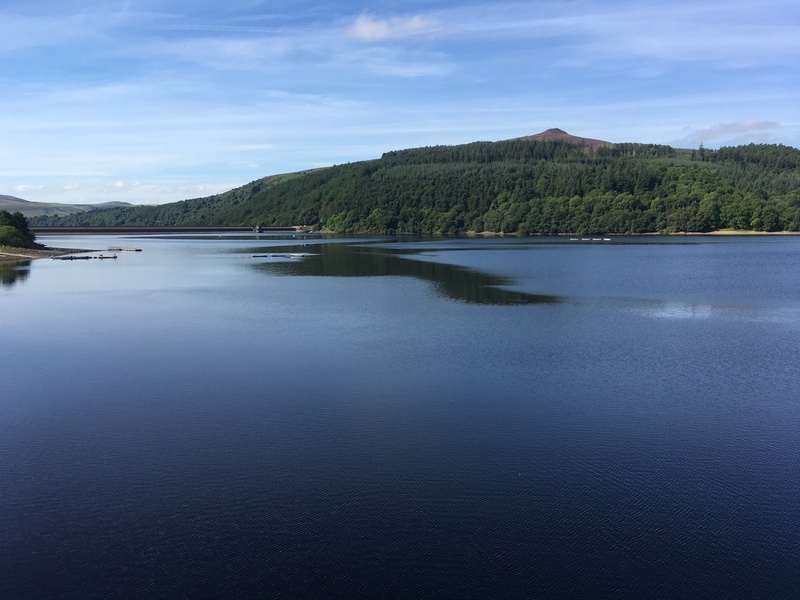 Pushchair friendly: Ladybower & Derwent offer many pushchair friendly trails, if walking to Bamford mill this is not accessible with a buggy. Public transport and parking: Bus 274 Sheffield to Castleton stop by on Yorkshire bridge and Ladybower Inn, see my public transport guide here. There is a train station at Bamford with direct route to Sheffield. Parking is available at a charge at Fairholmes, Heatherdene or in the village of Bamford. A little further out but highly recommend this one. 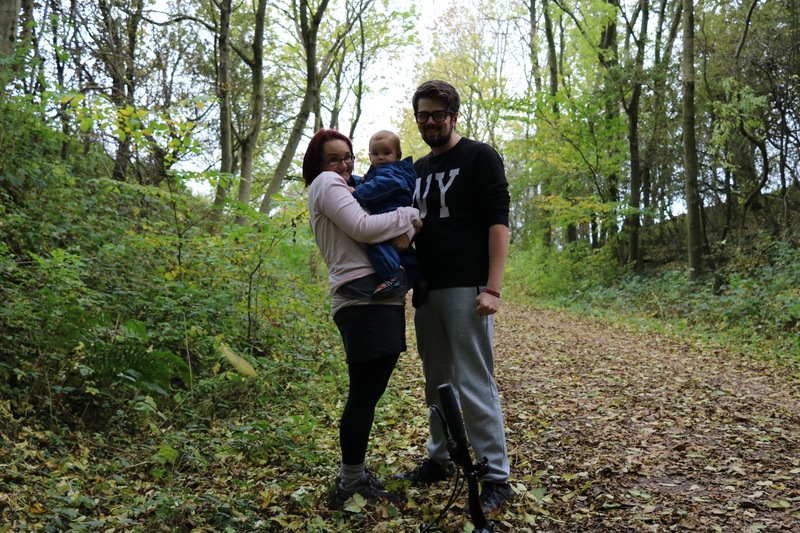 We were at the Tissington trail last autumn and can honestly say it’s a delight for family exploring. This old railway line is completely flat and accessible for bikes, pushchairs and wheelchairs. It’s 13 miles long from Ashbourne to Parsley Hay and plenty places to stop along the way for refreshments, photographs and facilities. 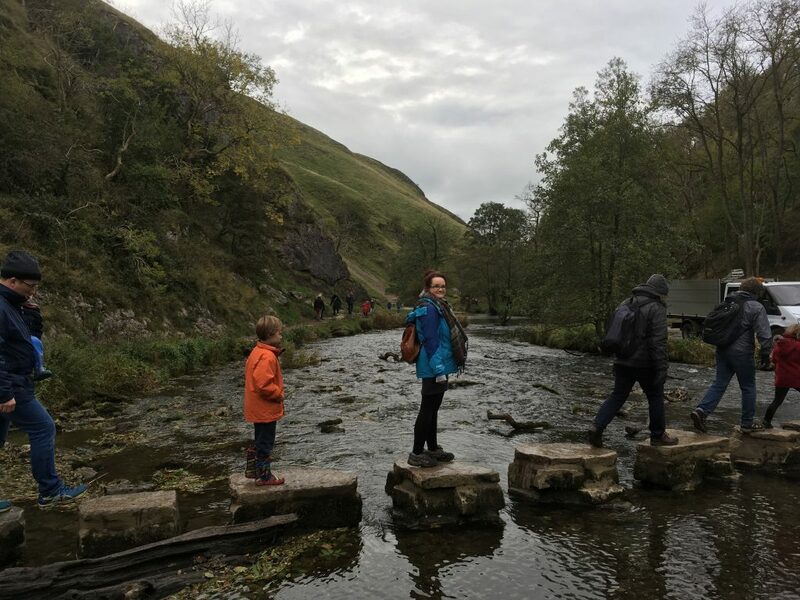 It is not far to Dovedale, too, which is a delight and has the famous stepping stones. See this blog to see where we went! 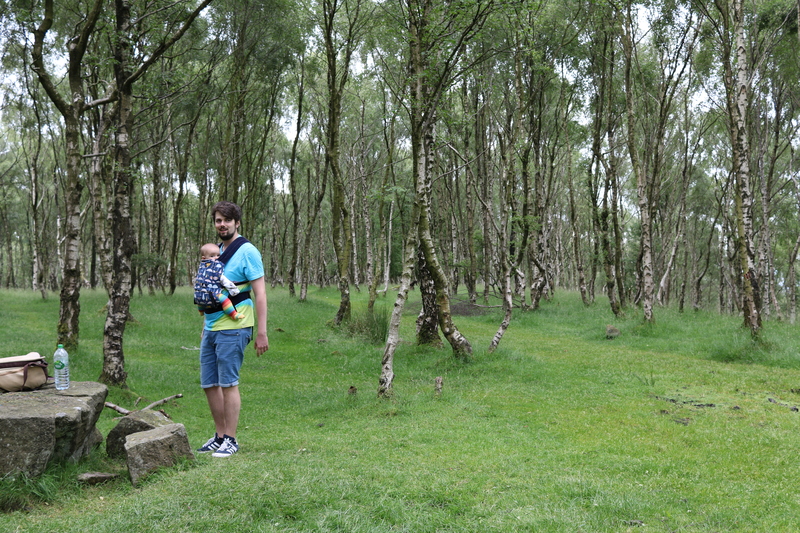 Pushchair friendly: Tissington Trail, yes, Dovedale, no, so use a sling. Walking shoes: Not needed but handy. Public transport and parking: You can access the start of the trail from Ashbourne town via public transport (railway from Sheffield). There are bus links to Matlock, Derby, Belper and Buxton from Ashbourne. There are numerous car parks on the trail. Thanks for reading! Please don’t forget to subscribe to my blog for lots more days out and walk ideas. Although I’m not a walker I’d be interested in running some of the routes you have talked about here. A really interesting read into some locations I hadn’t heard of before. There’s nothing I love more than a good weekend walk! Beautiful pics ? All those trails and walks look really splendid. I’m planning to spend 3 days around Peak District next spring on the Buxton side of the park. Wondering if you’d have any recommendations for towns and trails to check out.